Sign Posts & Stands by Street Sign USA! Street Sign USA offers a fine selection of sign posts, stands and bases to mount all of your new signs. Posts are available in 3 styles, the popular U Channel Sign Post, Round Pipe Post and the Square Post. From sign posts & brackets to vandal resistant nuts & bolts, we carry virtually everything you need to professionally finish your sign related projects! Mount your signs professionally with our line of sign posts & stands. 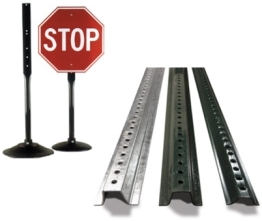 Stands & bases are ideal for temporary traffic control or permanent applications. Use for work zones, shopping malls, schools & more!